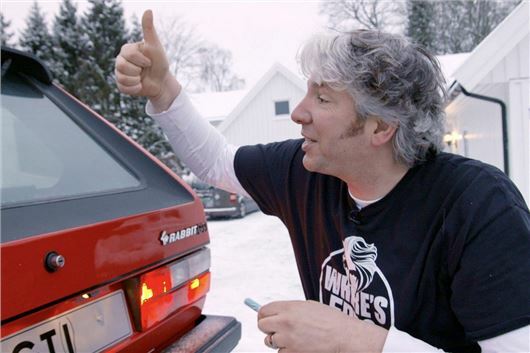 Our favorite mechanic, Edd China from Wheeler Dealers, is back with what he hopes will be a new series. In Edd China’s Garage Revival, Edd will work with car owners whose restoration projects have stalled. In the pilot episode, Edd travels to Norway to get a Mk1 Golf GTI back on the road. Great to see Edd back on the screen again. New idea for a show too. Brilliant. The day after I asked HJ for some advice about rear disc corrosion, he arranged for Edd to demonstrate how to fit new rear discs to a car. Now that is what I call dedication to his calling....Cheers HJ.....and Edd. Good news! In my view, previous shows with Mike B were ruined by the eternal pseudo arguments. Furthermore, too much airtime was spent in locating “suitable” vehicles on which to work and insufficient time on Edd’s instruction and tips. How good to see the real star of Wheeler Dealers away from the condescending Mike Brewer saying about "My Man Ed" will fix that, I didn't think it was a master slave relationship, even though acted. And don't get me started on his "finking frough a fought. Well done Ed me owd china :) Wishing you well for the future. Good luck ed you are the star from wheeler dealer . We wish you well and can't wait to see you on your own programme. All the best from your great fans marylyn and David from hoddesdon. Ed really was great on WD, he made everyt task look achievable, he gave you the belief that we could do those mechanical tasks ourselves. Not only that but people respected him for his honest and simplistic approach and simply the fact that he came over as a really nice guy. Like all your thousands of admirers Ed I wish you the best of luck with you new show, I am sure it will be a big success. Ps. I do think the criticism of Mike Brewer is unfair.WD is a show and we really do not know the format the producers wanted the show present on screen.